In September 2016 we were asked to quote for a job at Sydney Airport. The job involved hydromulching the area on either side of the new runway being built to accommodate the larger wingspan of the new A380’s. The area had previously had a bitumen emulsion applied, but that had not enabled any vegetation to establish itself over time was being broken away by the jet blasts. This left the area exposed, creating an avenue for foreign particles to be sucked into the jet engines. 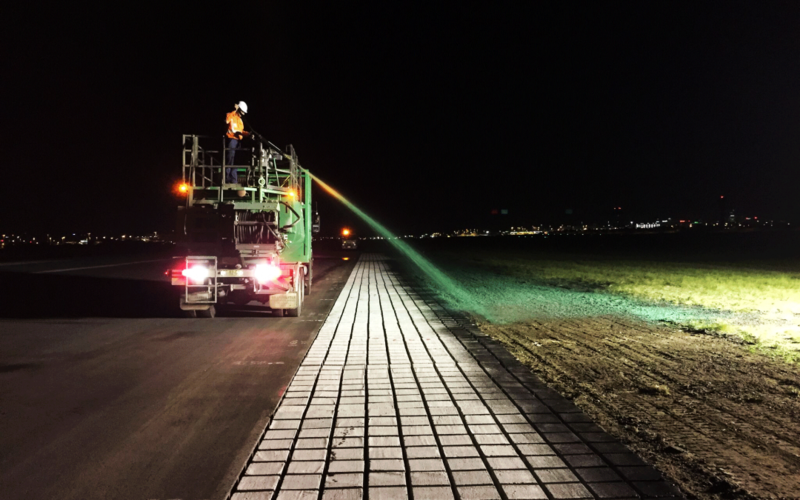 Sydney Airport approached PPG Wrightson Turf, to see if they had a product that would give an effective solution to the problem of foreign particles getting into the jet engines from the jet blasts and wildlife strikes. result in Foreign Object Debris (FOD). Another issue was also the timeframe available to apply the product. Although Sydney Airport has a curfew, is still a busy airport. PPG Wrightson Turf suggested the use of Flexterra (HP-FGM) combined withBermudagrass (couch grass) and Avanex, which is a bird deterrent grass. Whilst the Flexterra has high germination and growth establish, the Avanex is a cost effective way of reducing insects populations and resident bird populations. As we were spraying near a runway, it is important to not encourage wildlife to feed on the grass seed as wildlife strikes can cause serious problems for aircraft. The Avanex produces high levels of alkaloids and a naturally occurring fungus. Bermudagrass is a perennial warm-season grass, meaning it comes back every year and grows most actively from late spring through hot summer months. It is heat, drought, traffic and salt tolerant. Although the application of the hydromulch didn’t differ from normal applications, working at Sydney airport during curfew hours involved a lot of forward planning and a mobile crew to enable immediate evacuation should a plane need to land. With 4000 m2 done each night, sometimes with only 30 minutes left before first flights, it gave an immediate example of how well the Flexterra could withstand the jet blasts from the A380. So far the grass has withstood 12 months of planes entering and leaving Sydney Airport with little damage done, thus meeting the Sydney Airport criteria. December 2, 2016 –The HP-FGM is fully intact after a few days of exposure to jet blast and the Australian summer. December 7, 2016 – The HP-FGM is still unscathed and vegetation is beginning to establish. December 13, 2016 – Vegetation density is increasing substantially every week. January 17, 2017 – Continued establishment. May 17, 2017 – Fully established Bermudagrass begins to go dormant during the Southern Hemispheres Fall season. Copyright © 2018 Grassmaster Environmental Services | All rights reserved.